DENVER, Pa. – There’s nothing like a long-held, well-seasoned collection to jump-start a collecting niche that has gone quiet. Dan Morphy, CEO of Morphy Auctions, said he saw the positive effect for himself at two previous Morphy sales that included rare pieces of Amphora pottery from the renowned Les Cohen collection. He expects similar interest and continued strong results at his May 25, 2013 event. The Amphora selection set to open the company’s 750-lot Fine Art & General Antiques sale could very well make it a lucrative trifecta for consignors, Morphy said. Amphora ceramic dragon vase, mint condition, impressed Amphora oval mark and Austria mark. An example is illustrated on Page 105 of The House of Amphora, by Richard Scott. Estimate $7,000-$9,000. Morphy Auctions image. More than 150 pieces of Amphora – including several prized examples from the Cohen collection – lead the May 25 proceedings. Animal forms include a vase with opalescent frits and four cats’ heads in relief, est. 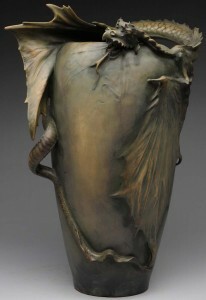 $5,000-$8,000, and a dragon vase with realistic reptilian scaling on its convoluted tale, $7,000-$9,000. A monumental Amphora Gres-Bijou vase in mint condition, its underside impressed with an Imperial crown and Amphora Austria mark, is very similar to an example illustrated on Page 251 of Monsters and Maidens, Collectors Edition by Byron Vreeland. It could reach $8,000-$10,000 in the May 25 sale. Markings are especially important to Amphora collectors, Dan Morphy said. Amphora pottery was produced by the Amphora Porcelain Works from 1910 to 1945 in the Turn-Teplitz region of Bohemia, now Trnovany in the Czech Republic. Because Bohemia was part of Austro-Hungary prior to World War I, examples produced there were marked “Austria.” Pieces made after the war are identified with a “Czechoslovakia” mark. The Amphora selection will be followed by Zeck, Rookwood and Roseville pottery. Highlights include a Rookwood umbrella stand, Roseville Futura jardinière and pedestal, and Roseville 10in Sunflower vase. All three items carry individual estimates of $1,000-$1,500. Among the 85 lots of Breininger Pennsylvania pottery are a dog with basket, $400-$800; handled pitcher, $800-$1,200; and a Santa in sleigh pulled by reindeer, $400-$800. Art glass lighting to be auctioned includes a Tiffany Studios 16in Daffodil lamp, $18,000-$25,000; a Handel with floral-design shade, $3,000-$4,000; and a Pairpoint lamp with reverse-on-glass shade and butterfly motif, $1,200-$1,500. Many beautiful designs are seen in the 50-piece selection of art glass. A circa-1902 Loetz metallic red Phanomen Gre glass vase, signed “Loetz Austria” in the polished pontil, is the same form that appears on Page 1267 of the “Neue Gallerie” book. It is entered with an estimate of $3,500-$4,500. Other Loetz highlights include a 14in vase, $2,000-$3,000; and a 12in green glass vase, $2,000-$2,500. A art glass vase overlaid with silver is cataloged with a $3,000-$4,000 estimate, while a Daum Nancy “pillow” vase is expected to make $1,800-$2,500. Monumental Amphora Gres-Bijou vase, mint condition, underside impressed Imperial crown and Amphora Austria mark. An example is illustrated on Page 251 of Monsters and Maidens, Collectors Edition, by Byron Vreeland. Estimate $8,000-$10,000. Morphy Auctions image. The auction will then move into a more general offering of fine art, clocks, Americana and even several desirable violins. The top-estimated painting, at $5,000-$10,000, is Guy Wiggins’ signed oil on board titled Midtown Winter; while the upper end of the clock section is dominated by a Black Forest Eagle clock, $5,000-$10,000 and an American tall-case clock with moon dial, $5,000-$10,000. The sale will conclude with 125 lots of coins representing the second consignment to come to Morphy’s from the Pennsylvania Treasury’s Bureau of Unclaimed Property. A lot comprised of 23 gold coins is estimated at $9,000-$11,000. Other coins expected to find favor with collectors are a Lincoln cent 1909-1940 set that includes key dates, $1,500-$2,000; a Lincoln cent 1941-1976 set with a 1955 double die, $1,500-$2,000; and a Walking Liberty half dollar set, $1,500-$2,500. Also part of the Treasury consignment are many rolls of silver dimes, half dollars and dollars. The Saturday, May 25 auction will commence at 9 a.m. Eastern Time. Morphy Auctions’ gallery is located at 2000 N. Reading Rd., Denver, PA 17517. All forms of bidding will be available, including live via the Internet through Morphy Live or Artfact. 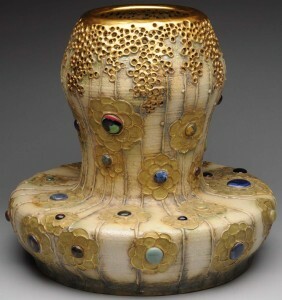 View the fully illustrated catalog online at www.morphyauctions.com or www.artfact.com. For additional information on any lot in the sale, to order a catalog or to organize a phone line, call 717-335-3435 or email serena@morphyauctions.com. Visit Morphy Auctions online at www.morphyauctions.com.